Global Wireless Audio Devices Market is expected to garner $38,807.5 million by 2022, registering a CAGR of 24.4% during the forecast period 2016-2022. The Global Wireless audio devices market are used to transmit and receive various audio signals through wireless technologies, namely, Wi-Fi, Bluetooth, and AirPlay, among others. Wireless headphones, microphones, speakers, sound bars, and audio systems, radio tuners, and others are various types of wireless audio devices available in the market. Increasing penetration of infotainment devices, rising adoption of mobile devices, and increasing applications of wireless audio devices in the commercial sector including, events, shows, call centers, and others are the key driving factors of the market. Stringent government regulations have been imposed regarding the frequency range of audio devices. In addition, use of these devices at more than 85 decibels (dB) for 8 hours or more could adversely affect hearing ability of users. These factors restrict the expansion of the market. However, rapid technological advancement and increasing need for convenience such as ease in portability and remote accessibility among customers would generate significant opportunities for market players. Wireless audio devices find applications in four major sectors, namely commercial, consumer, automotive, and others, including security & defense. Wireless audio devices are used as support accessories for smartphones, laptops/computers, and gaming consoles in the consumer sector. Commercial sector comprises wireless devices used at office spaces, industries, and other commercial establishments such as IT parks, sport complex, hotels, and government organizations. In addition, increasing use of in-vehicle infotainment devices, advanced driver assistance system (ADAS), and GPS devices has boosted the utilization of wireless headphones, speakers, and others in cars, trucks, buses, and other automobiles. Prominent players offering wireless audio devices across the globe include Apple, Inc., Bose Corporation, Harman International Industries, Incorporated, Sony Corporation, Shure Incorporated, Koninklijke Philips N.V., Sonos, Inc., VIZIO, Inc., VOXX International Corporation, and Sennheiser Electronic GmbH & Co. KG. The wireless audio devices market is segmented on the basis of product type, technology, application, and geography. The product type segment includes wireless headsets & microphones, wireless speaker systems, sound bars, and others including radio tuner, power amplifier, A/V controller. Based on technology, the market is segmented into Bluetooth, Wi-Fi, AirPlay, and others, including SKAA and Sonos. The application segment comprises commercial, consumer, automotive, and others, including defense and security. The wireless audio devices market is analyzed on the basis of geography, which includes North America, Europe, Asia-Pacific, and LAMEA. The wireless speaker systems dominated the global market in 2015 due to features such as portability, remote accessibility, and compatibility with computer and infotainment devices such as mobile phones, tablets, and laptops using Bluetooth, Wi-Fi, Radio Frequency, and SKAA technologies. However, the sound bar segment is expected to grow at the fastest CAGR during the forecast period, owing to its compatibility with LED TVs, mobile devices, coupled with growth of the consumer electronics market. North America generated the highest revenue in the global market in 2015 due to higher adoption of electronic devices and high disposable income of consumers. 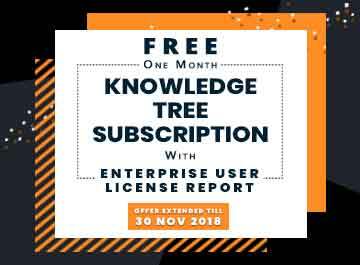 The penetration of infotainment devices such as televisions, PCs, mobile phones, laptops, tablets, and in-vehicle infotainment devices has increased in the recent years; thereby, increasing the need for mobile accessories. Spiraling growth of the infotainment devices market is one of the major factors triggering the market growth. The demand for mobility services among consumers for seamless connectivity and ease accessibility of information and resources has increased in the recent years. Mobility solutions, such as cloud service, BYOD trend, mobile devices, wireless services, and others have been gaining popularity among individuals. The adoption of wireless audio devices has increased due to advanced features of wireless audio devices such as portability, easy manageability, and remote accessibility for audio communication. Wireless audio devices enhance experience of customers by providing easy and quick audio transmission, wireless operation, and ease of installation. Therefore, increasing demand for mobile services among customers is expected to drive the wireless audio devices market. Wireless audio devices are widely used in commercial sectors, such as media & entertainment, education, and corporate for various purposes including conferences, meetings, sport events, news broadcasting, and auctions among others. Wireless devices, such as wireless microphones, speaker systems, and headphones are widely used in the market. This is a major factor responsible for the growth of the wireless audio device market. The study provides an in-depth analysis of the world wireless audio devices market along with current and future trends to elucidate the imminent investment pockets. Current and future trends have been outlined to determine the overall attractiveness, and to single out profitable trends to gain a stronger foothold in the market. The report provides information regarding key drivers, restraints, and opportunities along with the impact analysis. Quantitative analyses of the current market and forecast for the period of 2014&dash;2022 have been provided to highlight the financial appetency of the market. Porter’s Five Forces analysis of the industry illustrates the potency of buyers and suppliers participating in the market. 8.1.5 SWOT analysis of Apple Inc.
8.7.4 SWOT analysis of Sonos Inc.
8.8.5 SWOT analysis of VIZIO Inc. FIG. 58 SWOT ANALYSIS OF APPLE INC. FIG. 73 SWOT ANALYSIS OF SONOS INC. FIG. 76 SWOT ANALYSIS OF VIZIO INC.
TABLE 22 SNAPSHOT OF APPLE INC.
TABLE 28 SNAPSHOT OF SONOS INC.
TABLE 29 SNAPSHOT OF VIZIO INC.
Wireless audio devices have been gaining increased acceptance in the commercial, personal, and automotive industries over the past few years, owing to their portability, convenience, cost-effectiveness, efficiency, and user flexibility as compared to traditional wired alternatives. 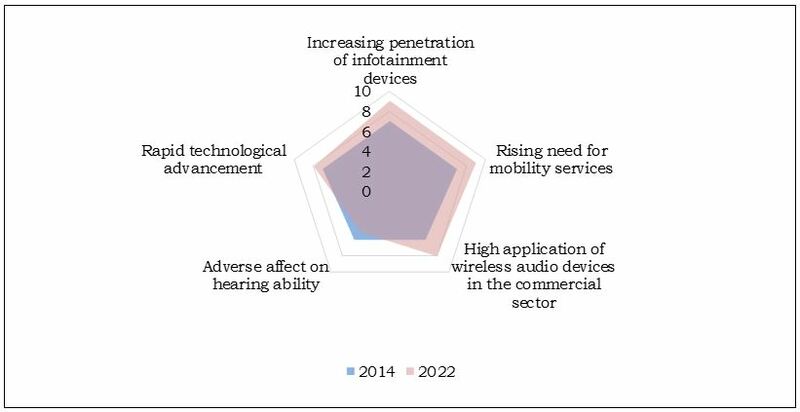 Wireless audio devices find major application in consumer and home devices due to rise in disposable income, changing lifestyle, increased consumption of multimedia electronics, and upsurge in the number of smartphone users. The demand for AirPlay-enabled wireless audio devices is expected to increase during the forecast period with its expansion in android devices. Market players offering android devices, such as HTC have licensed Apple’s AirPlay streaming technology to differentiate their products in the market. This integration of Airplay technology into android devices would create numerous opportunities for wireless audio devices in the forthcoming years. Increasing penetration of mobile devices and increased adoption of wireless audio devices in the automotive segment supplement the market growth. Asia-Pacific region is expected to grow rapidly during the forecast period due to heavy demand and decreasing raw material prices, rapid industrialization, and strong economic growth. North America is expected to contribute significantly to global revenue during the forecast period. Europe is expected to grow at a significant rate due to early adoption and increased awareness of wireless audio devices among end users. The wireless audio devices market is characterized by the presence of numerous players. Companies have constantly introduced upgraded and innovative products and services to increase their sales and customer base. Initiatives, such as customization in cloud solutions and mobile enabled applications have been widely accepted among customers.